Are you Suffering from a Meniscus Injury? 1. What are Knee Menisci? There are two menisci in each of your knees. The menisci rest between the femur (thighbone) and the tibia (shinbone). You have one menisci located on the inside (medial meniscus) and one on the outside (lateral meniscus) of your knees. The menisci are made of tough cartilage that fits nicely between the bones. 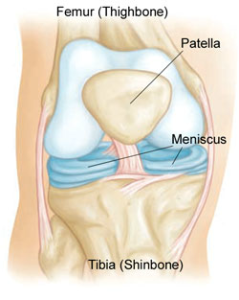 The menisci are important because they distribute weight across the knee joint. If you lack menisci, weight would be unevenly distributed across the joint, leading to uneven force distribution and early arthritis of the knee joint. Another important function of the menisci is to keep the knee joint stable. The menisci are crucial to the health of your knee. 2. What is a Meniscus Tear? The menisci are nourished by small blood vessels along the outer surfaces. They do not receive any nourishment in the inner areas. This becomes a problem when an injury occurs within the inner areas. Without the proper blood supply, essential nutrients cannot reach the injured menisci for healing to occur. As a result, the menisci do not heal properly. The two most common menisci injuries are from trauma (with athletes) or degeneration (usually older patients with brittle cartilage). A patient with a menisci injury will most commonly experience knee pain, swelling, tenderness, popping or clicking and/or limited motion or locking of the knee. When presenting with a suspected meniscus injury, x-rays and/or MRI’s are often performed to verify the extent of the injury. Visualizing a torn meniscus on MRI does not mean a specific treatment is required. Treatment depends on several factors. Not all meniscus tears require surgery. 3. What treatment possibilities exist for a Meniscus Tear? Treatment of a meniscus tear depends on several factors including: type of tear, response to conservative treatment and the activity level of the patient. Many menisci tears are treated non-surgerically via pain control modalities, rehabilitation, anti-inflammatory medications and/or cortisone injections. Please inquire in regards to the bolded non-surgical options performed here. Usually individuals with ‘mechanical knee symptoms’ choose surgery. Mechanical knee symptoms include locking (unable to bend), inability to straighten and/or a popping/clicking sound coming from the knee. When surgery is necessary, the surgeon has two primary options to improve mechanical symptoms. Either remove the torn meniscus (a partial meniscectomy) or perform a meniscus repair to place the edges of the meniscus together with sutures or tacks. Both are performed using a scope within the joint (arthroscopy). 4. What is the success of Menisci Surgery? The success of ‘reducing mechanical symptoms’ and healing completely from surgery is dependent on a few main factors: the location of the tear, and the patient compliance with rehabilitation. Location of Tear: If the tear is located in the central portion of the meniscus, it will have difficulty healing due to a lack of blood supply in the region. If the tear is located along the outside, it will heal better due to an available blood supply. Patient Compliance with Rehabilitation: By following the post-operative exercise protocol provided by your health care provider you will assist in the post-operative healing process and increase the success of reducing mechanical symptoms. If the meniscus repair fails, which happens between 20% to 40% of the time, a second surgery may be necessary to remove the re-torn meniscus. 5. What is the Rehabilitation time after surgery? Rehabilitation following a meniscus repair is more significant than when a piece of meniscus is removed. Following a meniscus repair, the rehab is more extensive and can take longer to recover (although varied, usually around 3-4 months to return to full activities). If removed, however, the patient is usually standing and walking within a couple of days post surgery. Within a few weeks, they are usually doing their usual activities of daily living. Dr. Luciano Di Loreto (Chiropractor) & Associates will help you through your healing process and full recovery. 6. Cortisone Injections for Meniscus Injury? Cortisone is a powerful anti-inflammatory (not for pain, but for inflammation). Cortisone injections take effect within a few days and usually last up to several weeks. The cortisone injection is injected with a small needle into the joint. Numbing medication known as Lidocaine or Marcaine is used to provide temporary relief while the cortisone is being injected. The most common side effect is known as the ‘cortisone flare’. This is when the area becomes more painful than before. This usually lasts a few days. Another common side effect is whitening of the skin (usually with those of darker skin) around where the injection was placed. This is not harmful, but patients still need to be aware of this as a potential side effect. Source: Greis PE, et al. “Meniscal Injury: II. Management” J. Am. Acad. Ortho. Surg., May/June 2002; 10: 177 – 187. What are my treatment options for a Knee Issue? Chiropractic Options at Fit for Life Wellness & Rehabilitation Centre: Dr. Luciano Di Loreto (Chiropractor) and his team of health therapists can help you rehabilitate your bones, nerves and muscles after a knee injury via both active exercises as well as passive treatments. Our extensive passive treatments include laser therapy (healing), ultrasound (healing), electrotherapy (pain), hot/cold therapy and soft tissue therapy. Treatments are usually booked two to three times per week for six to eight weeks. 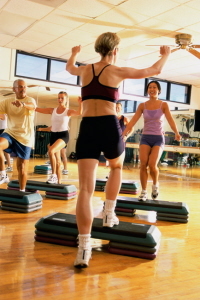 Full recovery of the knee area varies from individual to individual.